A new scientific study indicates the 2000-2004 drought in the North American West was the worst of the last millennium, with major impacts to the carbon cycle, and hints of even drier times ahead. The study, titled “Reduction in carbon uptake during turn of the century drought in western North America", published on 29th July in Nature Geoscience, shows that the major drought that struck western North America from 2000 to 2004 severely reduced carbon uptake and stressed the region's water resources, with significant declines in river flows and crop yields. The research group determined that carbon taken up by Western forests dropped by 30 million to 298 million metric tons per year. In normal conditions the forests would take up between 177 million and 623 million metric tons of carbon. Researchers found that the four-year drought was the most severe region-wide event of its kind since the last mega drought 800 years ago. The turn-of-the-century drought reduced plant uptake of carbon dioxide from the atmosphere by half in western North America. “The 2000-2004 drought may be the wetter end of a new climatology that would make the 21st century climate like mega-droughts of the last millennium,” said Christopher Schwalm, the research leader from Northern Arizona University. Under normal climate conditions North America absorbs carbon dioxide from the atmosphere due to plant growth, offsetting carbon emissions from the burning of fossil fuels. Climate models indicate drought conditions in the American West may be the new normal as the planet warms, expanding the region that is already chronically dry. 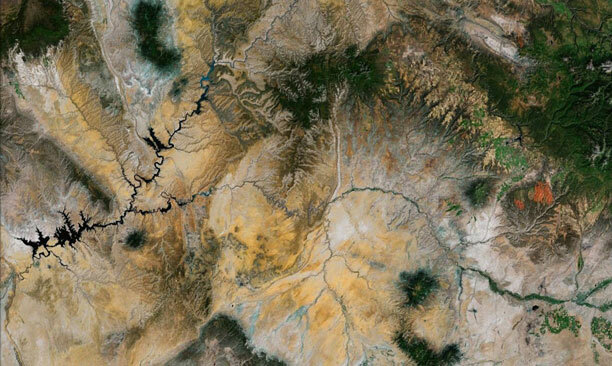 Above: An aerial image of the Four Corners area of the United States, with southeast Utah upper left, southwest Colorado upper right, northwest New Mexico bottom right, and northwest Arizona bottom left. Image Copyright © 2012 TerraMetrics, © 2012 Google, © 2012 INEGI. The current drought that has engulfed the country is as intense in the western United States as the 2000-2004 drought, but also includes large portions of the Midwest and Eastern United States. The country's most widespread drought since 1956, according to the National Oceanic and Atmospheric Administration (NOAA), has spread across 60 percent of the United States, which is in some stage of drought. Most of the remainder of the country is abnormally dry. The US Department of Agriculture declared 1,000 counties to be disaster areas in 26 states. In the last week in June 2012 there were 34 large fires burning throughout the country. Forest fires commonly occur each summer in the Western United States, but are invariably much worse in drought conditions. A small surface forest fire may reach 800°C with flames reaching one metre in height. Flame temperatures in an extreme fire can exceed 1200°C and reach 50 metres or more. Dry, drought stricken forests burn hotter, spread faster, and can easily become out of control. In 1988, 793,880 acres of Yellowstone National Park burned, causing a complete closure of the park for the first time. The largest wildfire in Colorado's history at Waldo Canyon near Colorado Springs in June 2012, swept over 17,000 acres, forcing 35,000 people to evacuate and destroying 350 homes. This year, wildfires started earlier than the normal fire season, partly because of low levels of precipitation last year, low snowfall and a lack of cold nights last winter, and an early, limited spring snowmelt and runoff, making forests very dry and flammable. Fires were also boosted by high summer temperatures in spring and early summer. The National Climate Data Center reported 41 heat records that were tied or broken in the first 4 days of the last week of June 2012. 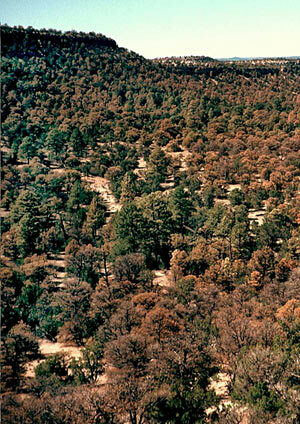 Below left: Drought stressed pinyon pine forest turning brown in 2002 near Los Almos, New Mexico. 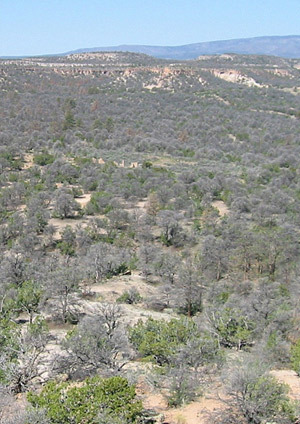 Below right: A photo taken from the same location, showing a mass of dead pinyon pine. Photo Craig Allen, United States Geological Survey. Droughts are part of the exacerbation of climate change in a cycle scientists refer to as positive feedback. In the positive feedback cycle, the reduction of carbon intake by vegetation during a drought amplifies an increase in atmospheric carbon. The greater level of atmospheric carbon amplifies the forcing of climate change, which then comes back in the vicious cycle to amplify the occurrence or the magnitude of drought and reduction in carbon intake by vegetation. In addition to reduced plant growth, a greater occurrence and magnitude of forest fires, which send carbon dioxide into the atmosphere, is attributal to drought. Drought may also induce disease in plants causing death, and vegetation will die from dehydration, sending carbon dioxide into the atmosphere. Climate	change is already affecting	extreme	weather. The National Academy of Sciences reports that the hottest days are now hotter. And the fingerprint of global warming behind this change has been firmly identified. Since 1950 the number of heat wave worldwide has increased, and heat waves have become longer. The hottest days and nights have become hotter and more frequent. In the past several years, the global area hit by extremely unusual hot summertime temperatures has increased 50-fold. Over the contiguous United States new record high temperatures over the past decade have consistently outnumbered new record lows by a ratio of 2:1. In 2012, the ratio for the year through June 18 stands at nearly 10:1. Though this ratio is not expected to remain at that level for the rest of the year, it illustrates how unusual 2012 has been, and how these types of extremes are becoming more likely. The significant increase in heat extremes, associated with a small shift in the global average temperature is consistent with climate change. The percentage change in the number of very hot days can be quite large. Global warming boosts the probability of very extreme events, like the recent "Summer in March" episode in the United States, in which thousands new record highs were set, far more than it changes the likelihood of more moderate events. Higher spring and summer temperatures, along with an earlier spring melt, are also the primary factors driving the increasing frequency of large wildfires and lengthening the fire season in the Western United States over recent decades. The record breaking fires this year in the Southwest and Rocky Mountain Regions are consistent with these trends. The impact of these changes can be devastating. The drought, heat wave and associated record wildfires that hit Texas and the Southern plains in the summer of 2011 cost $12 billion. Schwalm CR,	Williams CA, Schaefer K, Baldocchi D, Black TA, Goldstein AH, Law BE,	Oechel WC, Kyaw Tha Paw U, Scott RL, Reduction in carbon uptake during turn of the century drought in western North America, Nature Geoscience, 29 July 2012. Trenberth K, Meehl J, Masters J, Somerville R, Heat	waves and climate change, Climate Communication, 28 June 2012. Copyright © 2012 TerraNature Trust. All rights reserved.